The rain changed over to snow sometime October 3, 2013 and didn’t stop until October 5th. 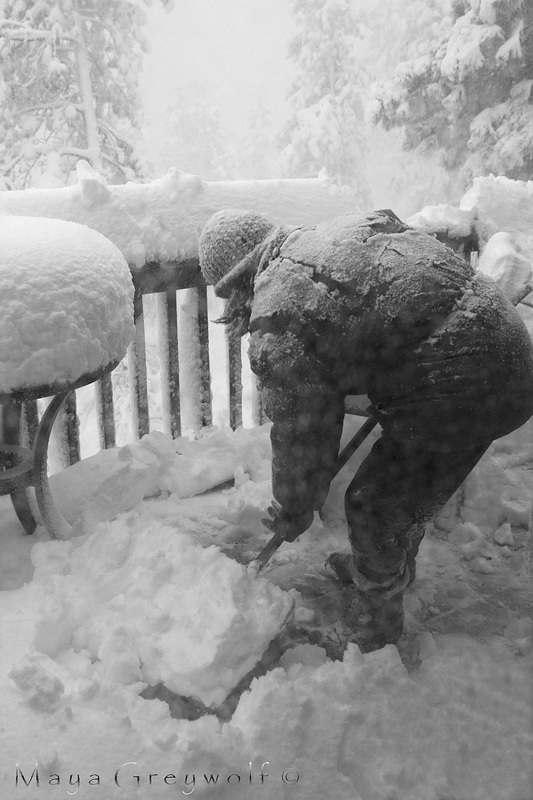 When it did, some areas of the Black Hills were buried in up to 55″ of snow; that, my friends, is over four FEET of snow! Winter Storm Atlas left 40,000 heads of cattle dead, and tens of thousands of people without power, heat, or the ability to travel for days. The first night, we listened to the trees dying an agonizing death. Big trees, some of them a foot in diameter were snapping in half. If even one had fallen on the house, we would have been in very serious trouble. When dawn finally rolled around, we saw dozens of our beautiful trees were destroyed. Before the storm, we had not been able to see the neighbors below us or the main road to town; now, both were glaringly visible – Atlas had stripped us of our privacy. We were without power for about three days. It was cold and uncomfortable but not unbearable. We had candles and flashlights, which allowed us to spend a little time after it was dark, to play cards or board games but quite frankly, being under the covers and sleeping, waiting for it all to be over with, was the best way to pass time. When the snow finally stopped, we began to shovel. Slowly, and in stages because after the initial onslaught, it began to warm up and the snow got heavier and heavier by the hour. I believe it was five days from the beginning of the storm before we saw plows descend upon the neighborhood. People were out in their driveways, not quite as celebratory as those lining the streets of Paris in 1944 but pretty darned happy nonetheless. We have done some preparations since that storm. There is a gas stove and range in the kitchen and a freestanding gas stove for heat in the downstairs. I suppose, as long as we can make coffee to drink and huddle around the stove, we’ll weather (yes, pun intended) whatever the gods, mythological or otherwise, throw at us. Tones of snow, indeed!! Great entry, Maya. Oh my, that is a lot of snow! While your images are so beautiful, I can’t imagine all the devastation this storm caused. Glad you stayed safe! Thanks Susan. I sure hope it was a 100 year storm and we’re safe for the rest of OUR lifetime – lol! Wow, that is some snow! It was indeed! We’re having a lovely October this year although we DID have some snow in September! We got a few flakes on the weekend here in Toronto. After being in the tropics I’m not looking forward to winter! This was last year…thank goodness! We’ve had a lovely fall this year, above normal temperatures and dry. Ha! This reminds me that I really need to get a snow spade. Thanks, Maya. Well if you get snow like this, I hope you also get a strong back to help you! Oh you scared me with this post. I am so not ready for snow yet. Preparations are indeed needed to be made. 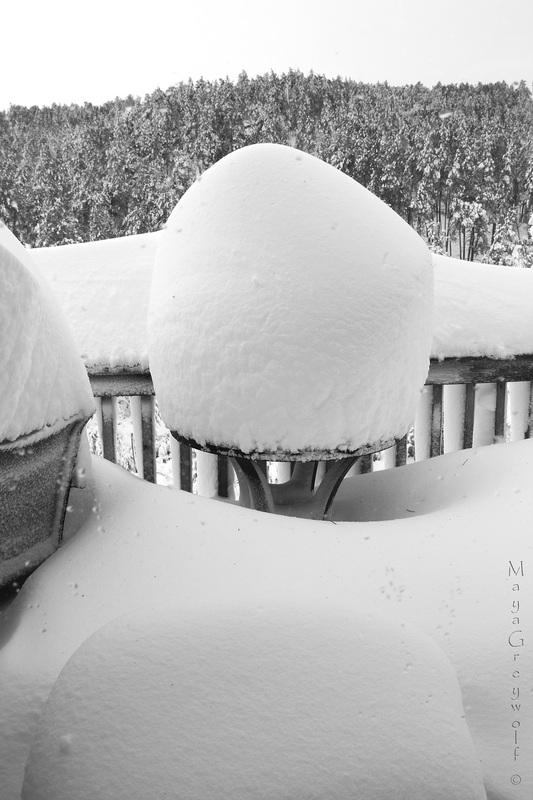 And hope that you NEVER see a snowstorm like this one because it’s darn near impossible to really be fully prepared! Let’s home there’s no repeat anytime soon. Nice pictures BUT this does not make me want to be up north or anywhere that I’d have to deal with that much snow. Winter sports are fun and I love it when there’s snow on the ground and the sun shines, BUT I do not want to be where it causes inconveniences or hardships. Hope this winter isn’t too bad for anyone. Oh, too much snow! (Another reason I’m glad not to be in New York anymore, and we got big storms there but this bad). I’m sorry you lost the trees. The gas stove will make all the difference next time, but I hope next time it’s far less. I really hope it was a once in a lifetime event for this area; I really don’t want to move again lol. Wonderful post. The photos point to a winter wonderland but I bet it was the opposite. It’s one of those once in a lifetime things. Hopefully. I really hope it was a once in a lifetime event!